Martin Wild has been Chief Innovation Officer (CINO) of MediaMarktSaturn Retail Group since January 2018. 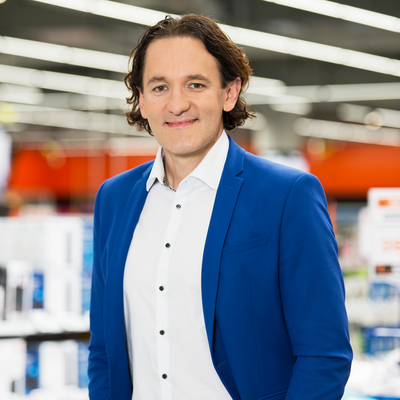 One of the pioneers of digital retail, at the age of 18 he founded the online electronics store Home of Hardware (hoh.de) in 1997, selling it a decade later to Premiere (now Sky Germany). He has been on the management of MediaMarktSaturn since 2011. As Vice President Multichannel, he handled the launch of saturn.de, his subsequent positions including CEO of redcoon. From 2014 until 2018, in his role as Chief Digital Officer, he headed the digital strategy and transformation of the entire MediaMarktSaturn Retail Group. He was included in Handelsblatt's list of the 100 smartest people in Germany and Werben & Verkaufen voted him 2018 in the category Digital Manager into the top100 personalities. Furthermore he is editor and author of the book "Digitization in Retail: Business Models, Trends and Best Practice". As Chief Innovation Officer he implements radically progressive innovations, drives innovation initiatives and works on new business models. Whenever robots roll through one of the stores, customers go shopping to Saturn by means of virtual reality, or the retail sector is shaken up by innovative startups and established retailers working together in the Retailtech Hub innovation platform, Martin Wild and his team are responsible.